Burned cars sit in a street in Paris, Dec. 2, 2018, a day after clashes during a protest of yellow vests (gilets jaunes) against rising oil prices and living costs. Anti-government protesters torched dozens of cars and set fire to storefronts during clashes with police. France will consider imposing a state of emergency to prevent a recurrence of some of the worst civil unrest in more than a decade and urged peaceful protesters to come to the negotiating table, government spokesman Benjamin Griveaux said Sunday. Groups of young men with faces masked, some carrying metal bars and axes, rioted on the streets of central Paris on Saturday, setting a dozen vehicles ablaze and torching buildings. Police say 133 people were injured and 412 were arrested in the riots. 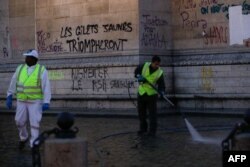 Workers clean around the Arc de Triomphe a day after a yellow vests (gilets jaunes) demonstration against rising oil prices and living costs, Dec. 2, 2018 in Paris. Graffiti on the monument reads "yellow vests will triumph." The authorities were caught off guard by the escalation in violence after two weeks of nationwide protests against fuel taxes and living costs, known as the “yellow vest” movement after the fluorescent jackets kept in all vehicles in France. President Emmanuel Macron will hold an emergency meeting with the prime minister and interior minister later Sunday to discuss the riots and how to begin a dialogue with the protest movement, which has no real structure or leadership. When asked about imposing a state of emergency, Griveaux said it would be among the options considered Sunday. “It is out of the question that each weekend becomes a meeting or ritual for violence,” he said. Protests began Nov. 17 and quickly grew thanks to social media, with protesters blocking roads across France and impeding access to shopping malls, factories and some fuel depots. Speaking on BFM TV late on Saturday, Castaner said the authorities had put all security measures in place to prevent the violence, but that they had faced extremely violent, organized and determined groups. He did however say the government had made a mistake in how it communicated its plans to move away from oil dependence, the policy that led to fuel tax hikes. He and Griveaux urged the yellow vest movement to organize itself and come to the negotiating table.